Package Contents: 1 Automatic Room Freshener Dispenser Machine, 2 AA size batteries, 1 Warranty card, 1 Automatic Room Freshener Dispenser Machine Refill. Taxes: Prices of Automatic Room Freshener Dispenser Machine, Room Freshener Refill & other products are inclusive of all the taxes. 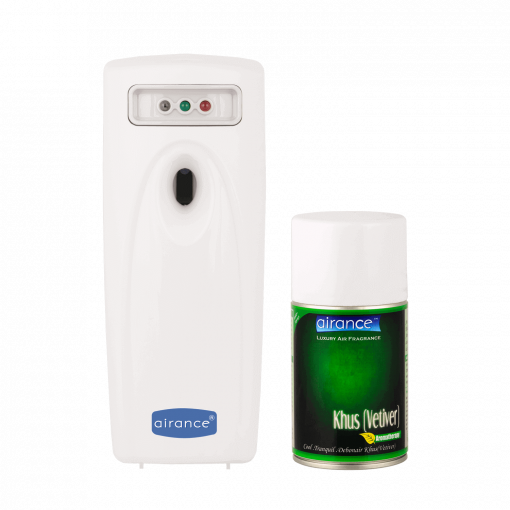 Click Here to know more about Automatic Room Freshener Dispenser Machine Refill. Click Here to know more about the Automatic Room Freshener Dispenser Machine. 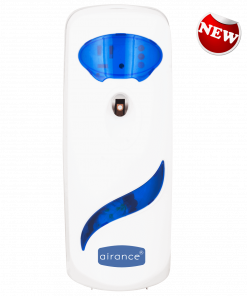 The Airance Automatic Room Freshener Dispenser is a fully automatic air freshening machine with light sensor which can spray automatically at pre defined time intervals. Eliminates Airborne Bacteria, Odours and fragrances the ambience 24 x 7. Instantaneous, Effective and Long Lasting European Air Fragrances. Light sensor makes this Automatic Room Freshener Dispenser Machine unique which saves wastage of fragrance. Light sensor mode enables the Machine to be operated in Day or Night mode automatically. Works on two AA size Batteries, which lasts upto 6 months. Eight time control interval spraying options of 7.5 Minutes,15 Minutes & 30 Minutes. Working mode option of Day, Night & 24 hours. A red light will blink to indicate that the Air Freshener Refill is finished. Effective area up to 6000 cubic feet. Facility of locking the Automatic Room Freshener Dispenser Machine is provided. It can fit 250 ml and 300 ml Airance room freshener refill. It’s a Self Standing machine which can be Wall Mounted also. Aesthetic design and features makes this Automatic Room Freshener Dispenser ideal for homes, offices, hotels, shops, hospitals and other public places. Light weight (300 gms), Small size (3.34 Inches Length x 3.22 Inches Width x 8.26 Inches Height) and convenience of placing the unit anywhere. Aesthetic design and features makes it ideal for homes, offices, hotels, shops, restaurants, hospitals and other public places. 2 Years Manufacturer Warranty on Automatic Room Freshener Dispenser Machine. Prices of Automatic Room Freshener Dispenser Machine & Room freshener Refill are inclusive of all the taxes. Call our customer care for complete telephonic demonstration of the Automatic Room Freshener Dispenser Machine , it’s features and installation procedure. Telephonic/Email/Whatsapp customer care for sales, service & support. Non physical damage problems are resolved by our customer care executives on phone itself. For repair & servicing of the Automatic Room Freshener Dispenser Machine, facility of door step pick up – drop of the machine is provided on request, saves time to visit the service center. Repair & servicing of the machine is also provided even after the expiry of the warranty period at nominal charges. Intensity Of Fragrance : Medium To Strong. 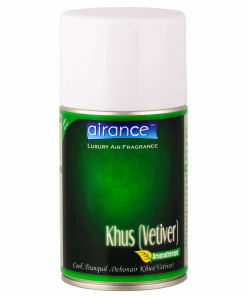 Fragrance Khus (Vetiver) : An Invigoratingly Fresh, Zesty & Rebellious Khus (Vetiver). Most of the Airance Fragrances contain natural ethereal oils extracted from plants and leaves through steam distillation process. Since ancient times, they have been known to have a great positive impact on mind and body. Airance fragrances have a unique formula for “Odour Absorber”. It instantly de-activates molecules of compounds that cause malodours. 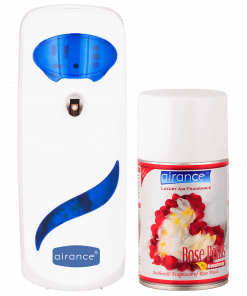 Airance fragrance bottles have 3000+ sprays, which makes it lasts for upto 6 months or more depending upon the frequency of the use. 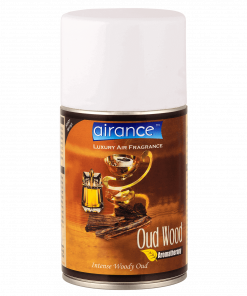 Airance Fragrances have highly effective aromatic ethereal oils which remain in the atmosphere for a longer time and are effective in areas up to 6000 cubic feet. 1. 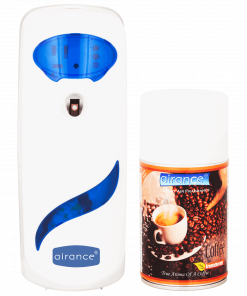 One Airance Automatic Room Freshener Dispenser Machine & Two AA Size batteries for machine. 2. 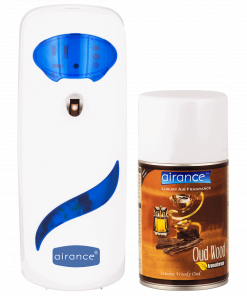 One Airance Automatic Room Freshener Refill Fragrance.